Identify any sport camp that fits your needs and submit the application and supporting materials (see below) by the Application Deadlines: April 26, 2019 for Spring/Summer camps or October 1, 2019 for Fall/Winter camps. Write a single-spaced, one-page typed essay explaining why you want to go to camp. A committee will review all applications. Scholarship funds will be directly applied to each specific camp’s tuition or registration by P4P2. Please note that scholarship funds cannot be applied to transportation, equipment, or supplies. Winners will be required to send P4P2 a single-spaced one-page summary following their camp experience. Click here to view a printable flyer with application information. Note: P4P2 does not host its own camps or directly support any camp. Any sport camp or training can be considered, and camps can be of any length. Once a scholarship has been awarded and the applicant has attended camp, she must follow-up with an additional one-page statement about her camp experience. Statements or portions of statements may be posted on The Playing for Power website. If you have any questions about making a donation, please email mail@playingforpowerproject.org. 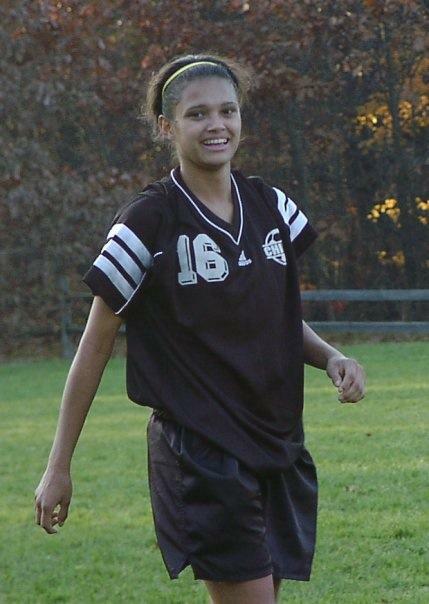 Mary playing soccer for the Piscataway High School Varsity Soccer team. Mary was a student-athlete from Piscataway, NJ who attended Seton Hall University in South Orange, NJ. Seton Hall awarded Mary both academic and athletic scholarships following her career at Piscataway Township High School as an outstanding student-athlete in soccer, track and basketball. 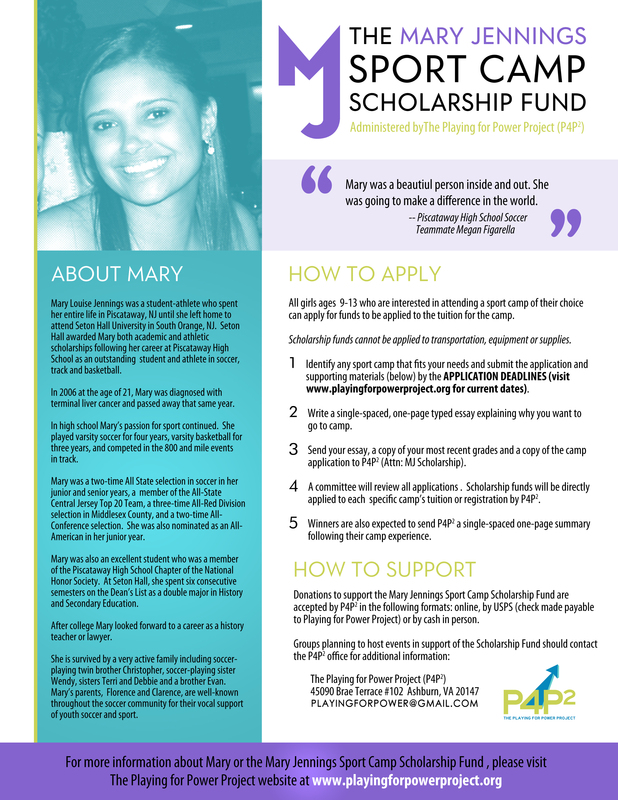 In 2006 at the age of 21 Mary was diagnosed with terminal liver cancer and passed away that same year. Mary was involved in sports at an early age, playing youth soccer for Piscataway Soccer Club and Elite soccer with Jersey Knights Soccer Club, Players Development Academy (PDA), and Jersey United. As part of the Jersey United team, Mary participated in a European Soccer Tour that included competition in Italy, Germany and England. She received many honors including being a two-time All-State selection in her junior and senior years and being nominated for All-American in her junior year. Mary was also an excellent student who was a member of Piscataway High School’s Chapter of the National Honor Society. As a double major in History and Secondary Education at Seton Hall, Mary was preparing for a career as a history teacher or attorney. Tenacity and dedication were traits Mary was known for all of her life. During her freshman year at Seton Hall she tore her ACL in a preseason practice and sat out the rest of the season, but she returned to play in her sophomore year. As a defender in soccer, Mary often marked the most talented forward on the opposing team. Her skill and determination were clearly evident in an exceptionally hard-fought match between high school rivals Piscataway and East Brunswick in 2000 where Mary’s commitment to defend Heather O’Reilly, who later became a member of the U.S. National Team, was relentless.